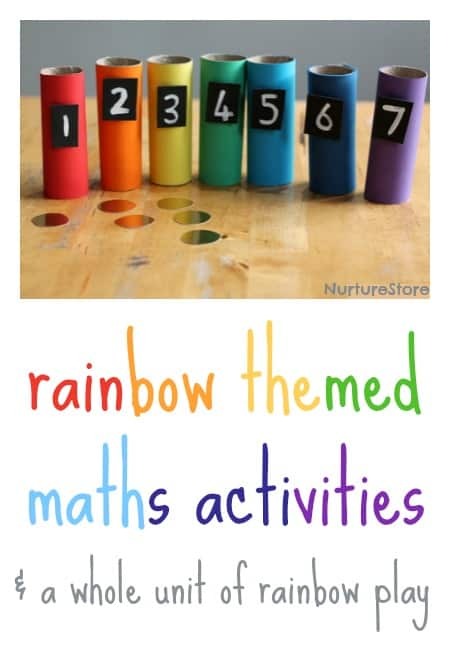 There are lots of ways to play with these simple maths materials, depending on the age and stage of your children. All have the benefit of being hands-on activities, with colour, active movement and sensory materials included to add interest and engage brains. 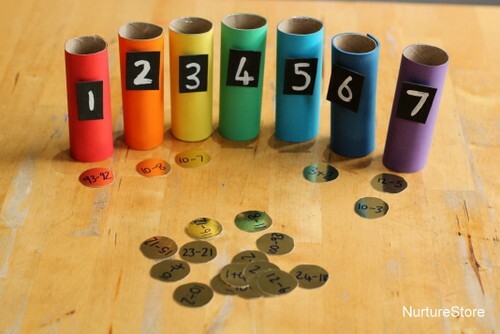 Very young children can sort the paper rolls into number order. Jumble up all the paper rolls and see if they can sort them out again, lining them up from one to seven. See if they can spot the numer that matches their age. Can they find the number that is one more than three? 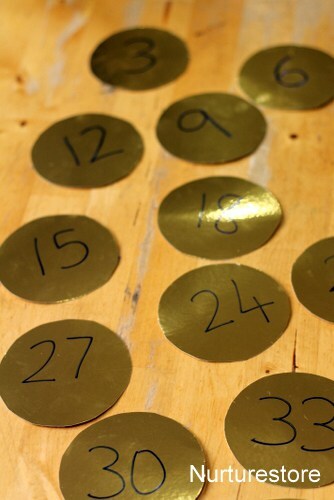 Use the ‘gold coin’ pieces of card and match the right number of coins to the written number on each paper roll. 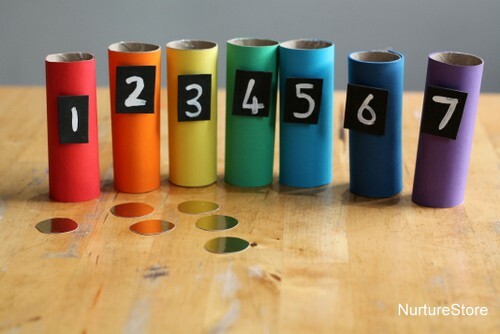 Pick two of the paper rolls and see if you can add the numbers together. Use the gold coins to count out and check your answers. 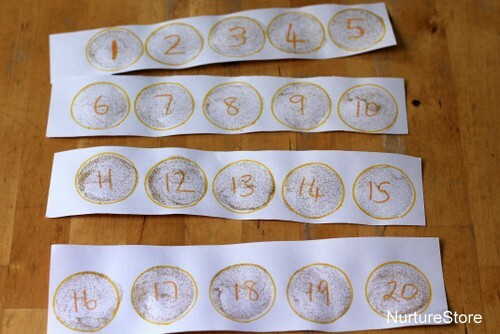 For older children, you can write on the gold coins using a permanent marker, making a set of questions to practise whatever maths facts they’re working on. I made a set to work on addition, subtraction, simple multiplication and simple division. 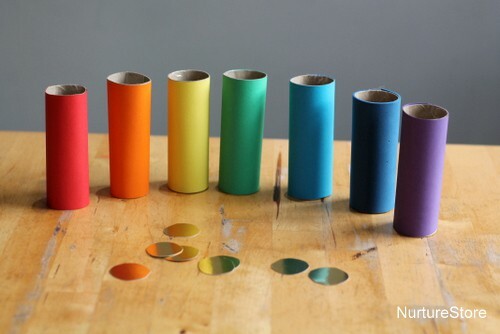 All the answers are either one, two, three, four, five, six or seven – so we can pick a coin, work out the answer, and match it up with the right rainbow paper roll. This is a good activity when you have a few children playing, perhaps siblings, or children of different stages. Include a range of questions, so younger children get lots that they are able to work out themselves, along with a few that stretch them. They might like to use the gold coin number line (see below) to work out the answers. Older children might use exactly the same set, to work on speed – seeing if they can recall the answers quickly. 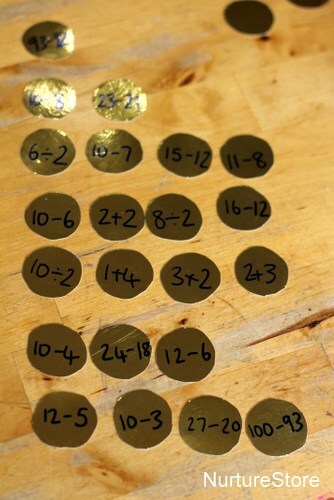 You might also make different sets of coins, for different levels of maths work. 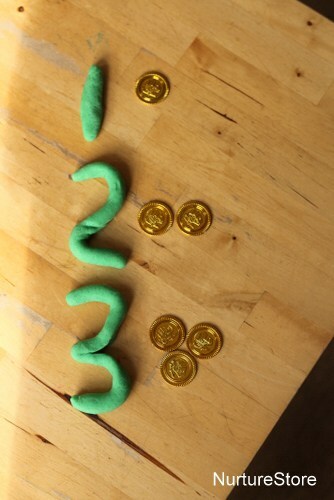 I also made a larger set of gold coins and wrote out a times table sequence on them. My daughter’s working on the three times table, but of course you can use any to suit your child. 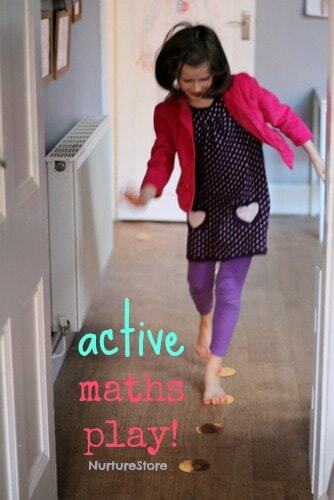 Use a thick card – obviously you don’t want it to be so thick it trips anyone up, but something which is sturdy enough to cope with some active play. To begin with I jumbled up the coins and asked my daughter if she could sort them out into a pattern, going from the smallest number to the biggest. Then we looked at our line of numbers and worked out each one was three more than the number before. 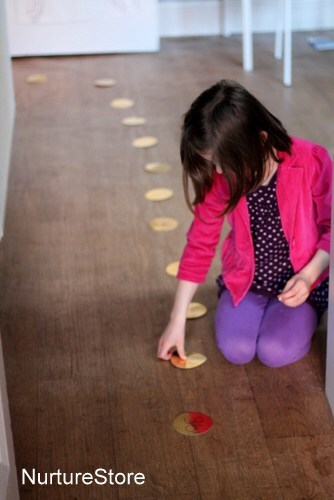 My daughter used sticky tack to fasten the gold coins in place along the floor, to make a number path with gold coin stepping stones. Now when she’s going from room to room, she can hop or jump from coin to coin, shouting out the times table as she goes. A fun way to regularly practise times tables. We also made a number line of 100 gold coins. We drew out circles in groups of five, as we’re also working on the five times table, and we’re using it as part of learning to tell the time. I’ll write up some ideas for using number lines, and come back and add in the link here. For another hands-on, sensory maths activity, take a look at how we use our St. Patrick’s Day play dough and gold coins for counting and matching games.